Columbus Property Management is proud to present Networks, an installation of new works by Nick Irzyk. The show will run from September 6 – 29, 2018, with an opening reception on Thursday, September 6, 6:30 – 8:30pm. 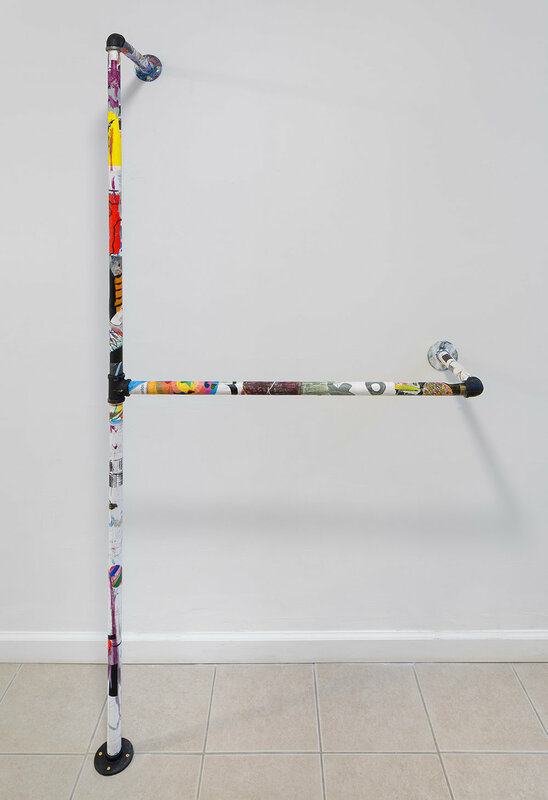 This exhibition will present a large-scale painting along with a grouping of sculptural works that incorporate collaged drawings, printed material, and paint adhered to galvanized plumbing pipes. Networks develops Irzyk’s ongoing engagement with the multiplicity and malleability of ideas and concepts, and uses principles of collage in both the painting and sculptures as a way to quote his previous works into a vocabulary. The surfaces continually slip from one form into another, never becoming fully nameable yet somehow remaining recognizable. The use of the pipes as material reinforces the designed nature of a network, allowing information to pass via structural application. This inbetweenness functions as a kind of ongoing visual digestion, moving Irzyk’s lexicon of images and symbols through the systems of painting, sculpture, and collage; ultimately dissolving these distinct modes of making into a common pool of constraints and possibilities. Nick Irzyk lives and works in Brooklyn, NY. He received his MFA from Virginia Commonwealth University in 2014 and his BFA from Massachusetts College of Art in 2012. Solo and two person exhibitions include: Nick Irzyk at Chin Up Bar, Baltimore, MD, Neu with Nicholas Sullivan at No Place Gallery, Columbus, OH, nature is the best techno at Syracuse University, Syracuse, NY, Rough Country with Michelle Segre at 247365, New York, NY and Triple Andrew at 106 Green, Brooklyn, NY. Recent group exhibitions include Essex Flowers w/ Catbox Contemporary, New York, NY, St. Charles Projects, Baltimore, MD, Underdonk, Brooklyn, NY, and Motel, Brooklyn, NY. He runs Step Sister Gallery in New York, NY. Hannah Barrett - "Welcome to my house"